Nokia Care Suite is the latest suite for all Nokia users. Nokia care suite is used to test, check, repair and update Nokia devices. This latest Nokia suite also includes a firmware download which can automatically download the latest firmware from Nokia's servers and is capable of flashing it onto the phone device. With the help of Nokia Care Suite, you can easily connect your phone to PC or laptop desktop and manage your phone device easily. 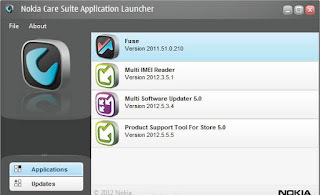 The Nokia Care Suite includes latest Fuse module, Multi IMEI reader, Multi software updater and Product support tool. The Fuse module is a connectivity manager between the phone device and PC Windows. The Multi IMEI Reader is a tool which reads the phone's IMEI number and the Multi Software Updater downloads the firmware from Nokia's servers and facilitates flashing the device. Connect phone device to PC. Information about the connected phone. Flash, re-install, update the firmware. Change Language of the phone device. Now download Care Suite to solve firmware related issues of Nokia mobiles Within seconds. NCS is a very useful multi-utility application from Nokia originally meant to be used at Nokia service centers. If you are going to use Nokia Care Suite first time, better go through a good tutorial multiple times before actually jumping into action. Because a simple mistake may brick your mobile for good, so do not blame us if something goes wrong due to any reason. Nokia Care Suite latest version support all Windows XP, 7, 8, 8.1 and Windows 10 (32 bit and 64 bit) operating system. Now you can easily use Nokia care suite to solve and fix mobile related issues in the comfort of your home at free of cost. So just click the given link and download Nokia Care Suite for free.